QuikWood® Epoxy Putty Sticks - Polymerics Systems, Inc.
QuikWood Epoxy Putty Stick is a hand-kneadable, fast-setting polymer compound for permanent repairs to wood. It also bonds to metal, glass, masonry and many plastics. It comes in a handy "Tootsie-roll®" form with the curing agent encapsulated in the contrasting color base material. QuikWood is available in three different shades: Original for pale, unfinished wood; Fast-Cure Pine for yellow wood; and Fast-Cure Dark for dark wood. Shades can be mixed to create or match other wood colors; mixing shades will shorten work life. Original QuikWood has a 15 to 25 minute work life. Fast-Cure Pine and Dark have a 3 to 6 minute work life and must be applied within 2 minutes of mixing. Functional cure occurs in 60 minutes. QuikWood is not intended for structural applications. Original QuikWood conforms to ASTM D-4236. 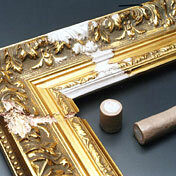 Restore gouges in picture frames. Can be sculpted or carved for intricate detail.